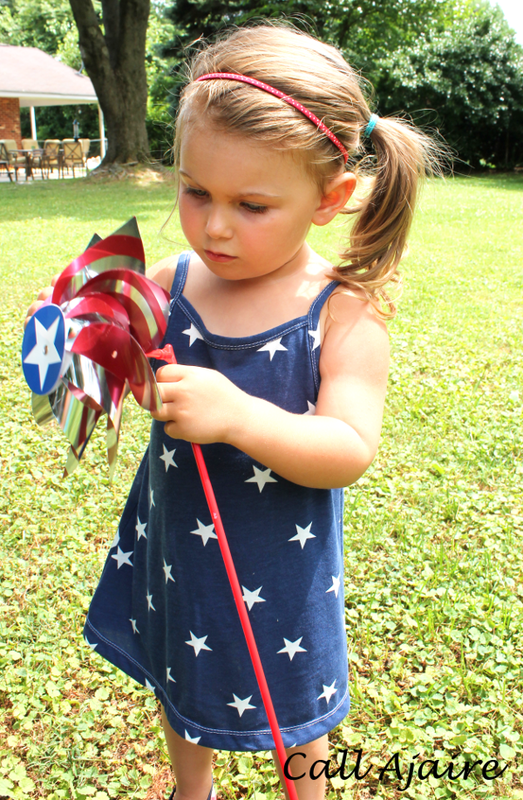 Tomorrow is Independence day and like many Americans my family will be celebrating with BBQ, fireworks, and friends. And of course, celebration called for another Shandiin. When I saw this starred fabric at The Fabric Fairy I had to add it to my order. 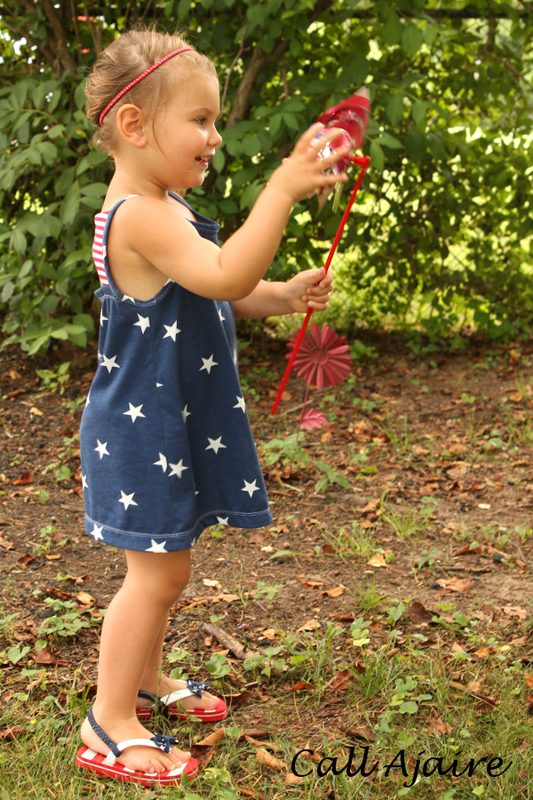 It’s not the best knit fabric – hardly any stretch/recovery – but the star pattern is great and I knew it would be perfect for Bean’s Fourth of July dress. The striped fabric is from Kitschycoo and is, of course really lovely. I only bought a small amount of it since I had planned to use it for this dress and maybe some bindings for a shirt for me, but now I wish I had bought more of it. As I’ve mentioned before, I’ve declared this the #summerofshandiin on Instagram, so it’s no shock that I used it for a Fourth of July dress. The pattern technically says not to use knit for any parts except for the main front and back, but since the star fabric doesn’t really stretch much and is a little stiff I threw caution to the wind and used it for the straps. I cut them in the direction of least stretch and not on the bias which makes a difference. They are holding up well so far. 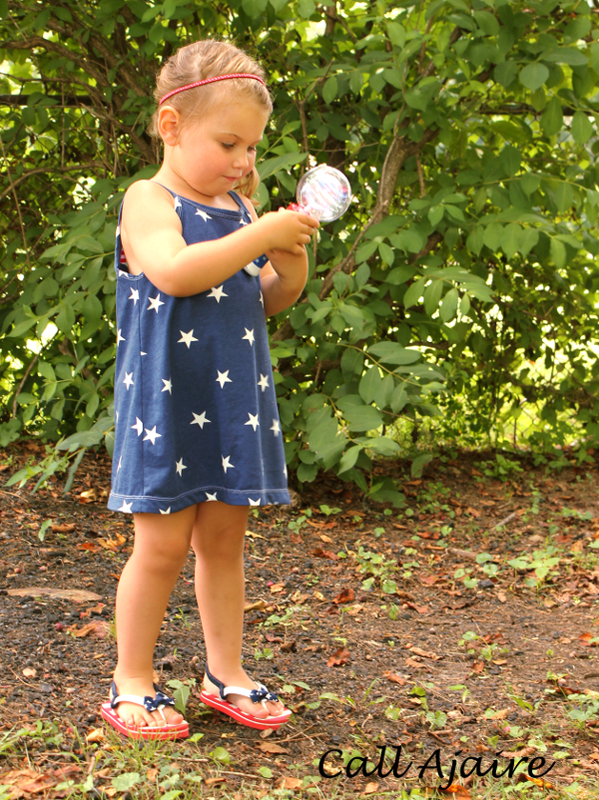 For this celebratory dress I took the size 3T Shandiin pattern and lengthened it by 2.5 inches at the waist on both the back and front tunic pattern pieces. I then retraced the line from the armpit down to the 3T hemline to be straight on both pieces. The length is perfect for cute little summer dress. For the upper back piece I used more knit (a no no according to the pattern), but I used a knit interfacing stabilizer to really hold it together. Since it’s a knit interfacing it will still stretch if tugged, but it’s doing a great job of keeping that cool cutout shape from sagging. I hope you are enjoying your summer. Ours has already been packed with lots of exhausting fun which is how summertime is meant to be, right? 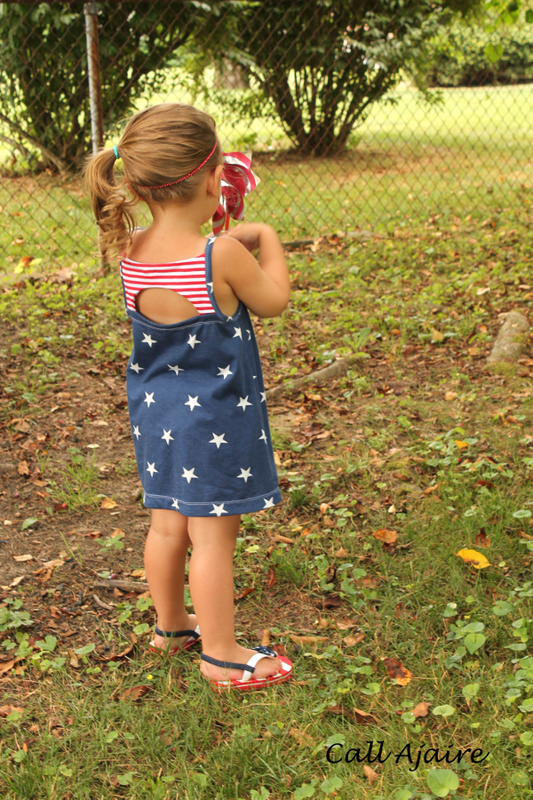 This little dress is gorgeous as is the little girl who is wearing it! You did good in both realms! Looks very beautiful AJ. Bean looks like she's happy as well. I hope y'all have an enjoyable 4th! Love y'all!! 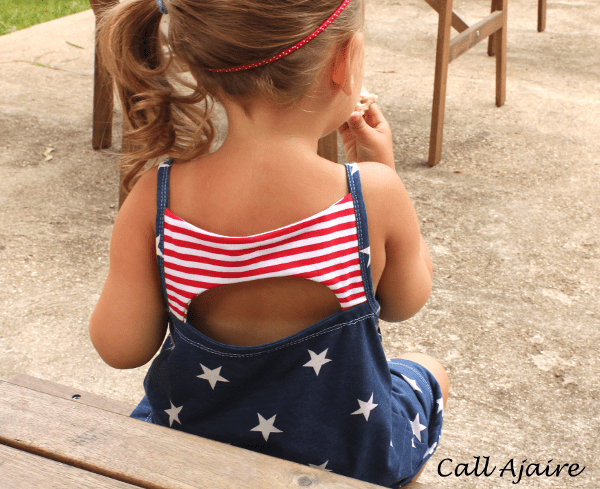 Lovely 4th of July dress!! Thanks Karly! The best part is that our fireworks plans for tonight were postponed due to weather until Sunday night so there's another occasion to wear it… other than just because it's awesome…. i don't want to hear any more about you being a bad sewing buddy! You are the best! You are just what i needed!!! I am serious. And if you are bad, well, so am i! That makes for outlaw buddies!!!!!! Seriously, i have learned from you at just the right pace. i have been so ill that i could not have done much more than be on the computer. You have been my buddy, sewing and otherwise. i actually feel that you were meant to be. Thank you for having such a passion for sewing and for your daughter (not necessarily in that order). Keep up the fantastic work. I love it- and the little flip flops too! I still have no idea what I'm doing tomorrow…er-today!! Have fun bbqing!! This is just so perfect!! Bean looks beautiful in her new Shandiin! Love love love it! Very cute! I had to go check out the pattern, added to my wishlist! I want that striped fabric too! Cute dress! I love the cut out in the back! I love how th star fabric looks like denim.